Denver's JW Marriott is offering a Family Fun Package providing your family with VIP treatment at this made-for-VIPs hotel and easy access to all of the area's family-friendly attractions. It's a luxurious basecamp for families who are driving cross-country as well as for those committed to hiking the Rockies. Located in Denver's charming Cherry Creek neighborhood, the hotel is within close proximity to the Denver Zoo, the Denver Botanic Gardens, the Children's Museum of Denver, the Denver Aquarium, the Denver Museum of Nature and Science, Coors Field and the Elitch Gardens Amusement Park (check out their concert schedule online). The whole city and its environs are especially appealing in summer, when cool mountain air envelops visitors and encourages kids to head outdoors to play. You can read about many of these good-for-kids activities in FTF's Guide to Denver with Toddlers. With rates starting at $229 per night, the Family Fun Package includes milk and cookies at turndown for a family of four, a complimentary in-house children's movie, and child-sized robes for use during stay. Complimentary services available to all families include a Milk and Cookies amenity, one complimentary children's movie and complimentary valet parking. 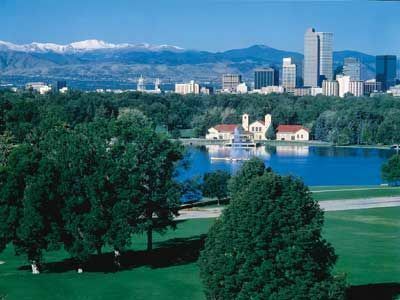 Enjoy spectacular views of the Rocky Mountains and Denver skyline by reserving a mountain view room. Kids will enjoy using the hotel's coloring book to play along with a scavenger hunt throughout the Cherry Creek neighborhood, while parents can use the Passport to Savings card which offers discounts at Cherry Creek's most popular kid-friendly attractions such as The Wizard's Chest, Cute as a Button and Kazoo & Co, complimentary valet parking and access to DVDs, books and board games. Kids can also play games, do arts and crafts projects and watch movies in the hotels' super popular foodie favorite, Second Home Kitchen, in the den while adults finish their meals. With 196 spacious and modern rooms offering views of the Rocky Mountains, the JW Marriott features two outdoor jacuzzis and a sundeck, in addition to a full-service spa, named one of the "Top 20 Spas" in Colorado by Denver Life magazine. Read more about what Marriott Hotels do for family travelers at this Marriott Hotel Review. For reservations or more information visit the Denver JW Marriott site and book with promotional code FML or call 886/706-7814 in the US and ask for promotional code FML. JW Marriott has the distinction of excellence and I suspect that this location is no different to the other Marriott owned hotels and resorts.